Economic fears are not diminishing. More than eight in 10 Americans think the economy is in another recession, according to a new CNN/ORC poll. One-third of those surveyed think it’s serious. It's disappointing to see CNN spreading nonsense that it takes two quarters of negative growth to call a recession. Two quarters is certainly a sufficient condition, it is not a necessary condition. Recessions are called by the NBER and nearly all them start while the economy is still growing. 35% say the recession is serious, 34% moderate, 13% mild. Only 18% say the country is not is recession. Click here for complete CNN poll results. I suggest the average person has it correct. In August, the number who Strongly Approve of Obama’s job performance was at 21%. That’s down three points from 24% in July and the lowest level measured during Obama's entire presidency. The previous low was 23% reached in both April and June of this year. Since July 2009, the number who Strongly Approved of the president’s performance has now ranged from a low of 21% to a high of 31%. 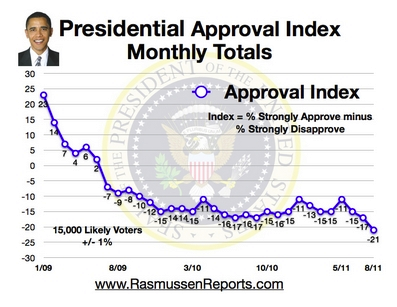 By comparison, 43% Strongly Approved of Obama's performance in January 2009. The number of voters who Strongly Disapprove of the president’s performance increased a point from July to 42% in August. The number of voters who Strongly Disapproved has ranged from 37% to 44% since July 2009.